Stella & Chewy’s is a great support to rescues. They have donated food to help foster homes.So foster dogs get to start their new life with GREAT food ! Testing aptitudes, adjusting attitudes ! 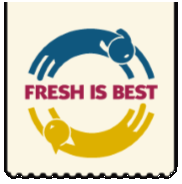 President and Founder of Fresh Is Best, Stacy LaPoint, started this company to achieve her goal of producing a human-quality, raw, grain-free, natural pet food and make it available to care-givers on virtually any budget. Stacy Krafczyk is an International renowned Professional Animal Communicator Specialist, Psychic/ Medium and a Reiki Master Teacher.